Without any doubt, this fight would be dubbed as one of the biggest domestic fights in British boxing history. The comparison in styles, skills and techniques are completely in inarguable. Both Joshua and Fury have immense talent that would make any boxing fan to use it as a tool of arguing ones point and as evidence. But the question at this moment remains is: Is there any closure to getting the fight made? Not quite or even the slightest. Fury (25-0, 18 KOs) has called out Joshua numerous times on Twitter including a recent stating: “Fantastic first week in camp. The weight is pulling off. I’m more focused and determined than ever, if @anthonyfjoshua don’t have the balls to sign to fight me then I’ll be out in late April/Early May. Feel like I never left! Feel like I never left!?? Joshua, who has been spending time in Dubai with his family has yet to respond to the tweet. Joshua also known as ‘AJ’ last fought in October ’17 when he stopped Carlos Takam in ten rounds retaining his IBF title. Six months earlier, he fought in a competitive slugfest with 41-year-old former unified champion Wladamir Klitschko and stopped him in the eleventh round. The fight was watched by more than ten million viewers in Germany and peaked at 658,000 viewers on America’s Showtime. Fury’s last bout was back in November 2015 when he defeated Klitschko for the WBO, WBA, IBF, and the IBO heavyweight titles. He also became the first fighter of Irish descent in 121 years to win the heavyweight title since Bob Fitzsimmons who won the belt in 1897. Perhaps one of the main differences between AJ (20-0, 20 KOs) and Fury was the way they individually fought Klitschko. Fury took control right from the very first round by using his height, reach and footwork to outwork Klitschko. The famous Klitschko right hand did not come until ten rounds later when the Ukrainian finally landed the shot but did very little effect. A complete clinical performance from Fury saw hit the Compubox numbers of throwing 371 punches and landing 86 with a connect percentage standing at 23%. 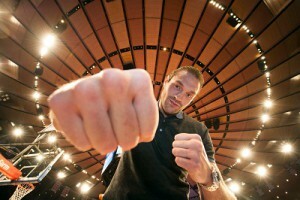 Klitschko, who constantly clinched and performed very little activity against Fury, threw 231 and landed just 52 (23%). With Anthony Joshua, Klitschko gained some momentum in the fight. Especially in round five where he was knocked down by AJ and took control with the remaining one minute eleven seconds of the round and stunned the Watford born fighter. Klitschko again took control in round six when he knocked down AJ with a 1-2 combination. The next remaining rounds were competitive with each fighter gaining momentum and exchanging hard hitting shots. That all changed in round 11 when AJ stopped Klitschko after dropping to the canvas once again and forcing the referee to stop the bout. CompuBox stats showed that Joshua landed 107 of his 355 punches thrown (30%), and Klitschko landed 94 of 256 (37%). In terms of height and reach, Fury stands at six feet nine inches with an 85 inch reach. Whereas AJ stands at 6 feet 6 inches with an 82 inch reach. By looking at the context of the bouts with Klitschko we can see a range of differences of how each fighter fought but the question of Fury’s inactivity of two years will be raised in many of the boxing fans’ mind.